The 47LN5400 is the best TV you'll find from LG without Smart features or 3D functionality. If you don't want anything to do with those options, stay right where you are. 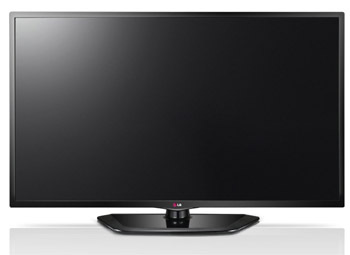 The LN5400 series displays at full HD resolution with a 120Hz panel for fast action playback. It doesn't get the Cinema Screen design that we think is so attractive, but there is no need to worry if picture quality is a bigger concern. The LN5400 series features direct lit LED backlighing. This type of backlighting still produces the same bright and colorful images as the edge-lit variety. The biggest difference is the depth of the cabinet. It can't be as thin as the edge-lit types. Screen uniformity performance can be better with this style of lighting as well since the lights are behind the screen and not around it. From what we've seen, it may be a minimal difference. Like all LED TVs, backlight levels are key to getting the best screen uniformity. A simple adjustment to reduce the back light brightness should take care of any uneven uniformity issues. This is yet another stigma consumers have to deal with when it comes to LED and LCD TVs. Historically off angle viewing has been rather bad, but we can see slight improvements. The 47LN5400 starts to see contrast and color degradation around the 25 to 30 degree off center mark. This is nowhere near as wide as some of the top tier models or plasma TVs, but it is more than acceptable in our book for an LED TV. It is nice to see a 120Hz panel on the lower end of the lineup. This feature excels at reducing motion blur and has been a solid performer on past LG TVs. In the LG 47LN5400 it works just as well. Motion blur and judder have always been known to be a problem for LED and LCD TVs. When this feature is enabled it does a decent job of keeping the two in check, though not eliminating the issue completely. Trumotion can also be turned off if any unwanted effects arise from the feature being enabled. The Game Mode isn't as hidden on this LG as it is on some other TVs. The LN5400 has a dedicated picture mode that is accessed from the top of the Picture Menu. Samsung hides their game mode deep in the menus and Panasonic puts it in the Advanced settings. LG's method makes it easy to turn the game mode on and off as many will be switching between games, movies, and TV a lot. If gaming is a major concern on your list while TV shopping, the 47LN5400 may not be what you are looking for. This one did not receive the upgraded GPU and dual core processor that the Smart TVs of the lineup got. This is going to be an issue for motion blur and judder. We even saw those problems on higher tier models. The Gaming picture mode is extremely handy for taking care of input lag. This is going to be the biggest concern, and the LN5400 delivers. If judder and motion blur are not problems, than this is going to be a decent choice. The rating for gaming is a 7 out of 10. The 47LN5400 may only have 2 HDMI inputs, but it has a few connectivity options for playing back content from other sources. The single USB port is located on the side of the TV and accepts a large variety of formats to cover just about any digital movie, show, photo, or music you can throw at it. The accepted formats are: DivX HD, JPEG, JPG, MPO, AC3 (Dolby Digital), EAC3, HAAC, AAC, MPEG, MP3, PCM, DTS. The 47LN5400 series does not implement the Cinema Screen design, so it misses out on invisible bezels and an extremely thin profile. Besides those issues, it manages to keep a nice subdued look without grabbing too much attention. 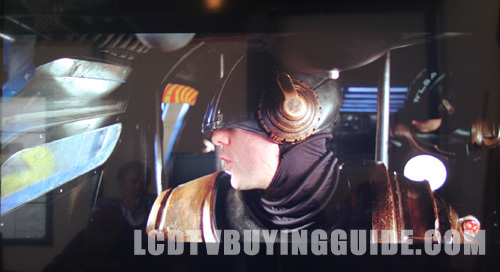 The lower end LG LED TVs don't have the same great speaker system as TVs like the LA7400. We think those TVs have some of the best on-board speakers on the market right now. The 47LN5400 features 2 one-way 10 watt speakers instead of 2 three-way 12 watt speakers. That makes a big difference. Volume is good on this TV, but the range of sound is empty in comparison. LG's different sound modes and Clear Voice II feature really helps round out the sound to make is more than tolerable. Sound quality scores a 6 out of 10 on the 60LN5400. 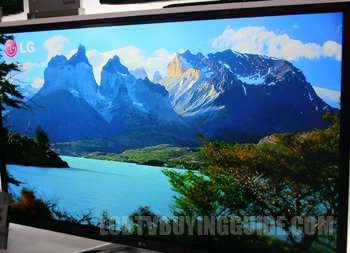 The 47LN5400 is in a very similar situation as the 50 inch version when it comes to value. There are a lot of competitors out there, but this LG always wins out on price. There aren't as many direct competitors in the 47 inch size class, but it is a strong value. The closest TV is the Samsung UN46F5500 that features internet connectivity and has a price tag of $100 more and one less inch of screen space. Dimensions with stand (W x H x D): 42.48" x 27.32" x 10.35"
Dimensions without stand: 42.48" x 24.76" x 3.17"